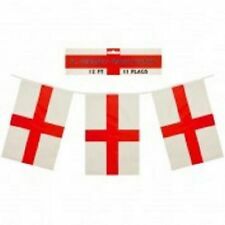 5m England St George Cross Fabric Flag Bunting Pennant Fete Party. England St George flag bunting- 11 flags- 12 feet in length. England Bunting 4.5m length 15' 8 flags 12" x 8"
Flag of England 12" x 8". Fabric: polyester. Collection in person. Cost is: Each mile from NG5 1FD is £0.40. Flag Bunting. 1 x Fabric Bunting. Any claims or disputes arising out of this contract must be made within an English Court. You are advised to test any face paint / make up / hair products on a small area of skin prior to general application. St George Red & White Plastic Square Shaped Bunting. England Flag Bunting. Football Supporter Celebration Party. 12 St Georges Cross Flags. and I will do my utmost to resolve any issues. 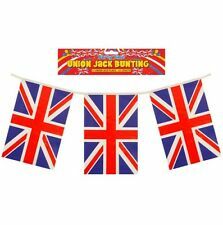 Amscan 3 M Pride Passion Party England Bunting Large Flag Accessory - Plastic 3. Condition is New. Dispatched with Royal Mail 2nd Class Letter. Popular licenced product Good quality item Attractive design Great party accessory A great party planning solution for those special events. . Double sided carefully made artisan bunting. Crisp quality 100% cotton fabric. Flags 11cm from head tape to point. White heading tape. 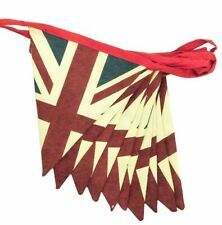 Union Jack Red White & Blue Plastic Square Shaped Bunting. 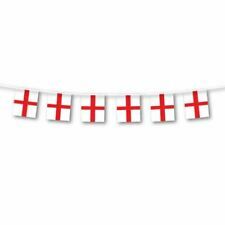 Amscan International - England Large Fabric Flag Bunting - 5m - 993881 Fancy Dress, Party Supplies, Balloons (supplied uninflated). Amscan Fancy Dress. Amscan 2: Hawaiian Flamingo Garden Stakes. Amscan Magical Unicorn Deluxe Pull Pinata.